The New Orleans Regional Transit Authority, or RTA, continues to operate four lines of historical streetcars. The St. Charles Line runs mainly parallel to the Mississippi River through Audubon Park and Fayette Cemetery, beginning at the edge of the French Quarter and then following St. Charles Avenue onto South Carrollton Avenue. A ride down the full length of the St. Charles Line takes approximately 40 minutes. Both streets offer a beautiful covering of live oak trees and take visitors past historical homes, as well as shops and restaurants located in historical buildings. The original St. Charles Line dates back to 1835 and is the oldest continuously operating rail line in the United States. The streetcars in operation on the line today are from 1923. One vintage streetcar from 1890 is still operational, but is used for special events only. The design of the electric cars is double-ended and double-trucked with an arched roof. The Canal Street Line takes passengers through the Central Business District, Bayou St. John, and Mid-City, ending at City Park or the historic cemeteries. The bright red Canal Street cars heading to the historic cemeteries are identified with the word “Cemeteries” on each car. Canal Street cars identified with “City Park/Museum” end at City Park, home to the New Orleans Museum of Art, a sculpture garden, botanic garden, and playground as well as several 200-year-old live oak trees. The Canal Street Line recently reopened in 2004 after having been briefly replaced by a bus line. 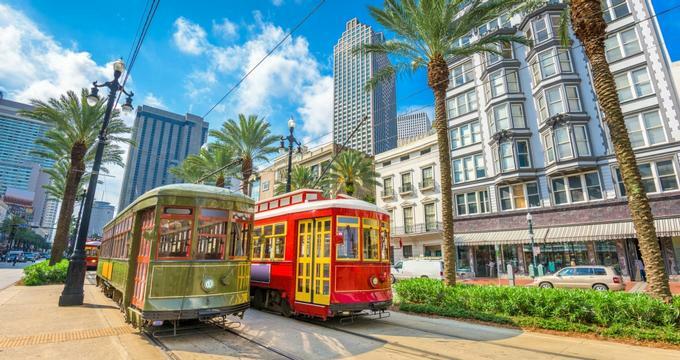 Although the cars are modeled after the original Perley Thomas streetcars on the St. Charles Avenue Line, they offer more modern amenities such as air conditioning. A one-way ride to either the cemeteries or the museum takes approximately 30 minutes. The Riverfront Line travels along the edge of the French Quarter, departing from French Market, the oldest public market in the United States. With newer streetcars similar to those on the Canal Street Line, a 15-minute ride takes passengers past the Aquarium of the Americas and Canal Place, ending at the Ernest Morial Convention Center. The Rampart Line is the newest of the four and opened in 2016. This line begins on Loyola Avenue at the Union Passenger Terminal and then travels through the Central Business District to Elysian Fields Avenue. Highlights along the 30-minute ride include the Mahalia Jackson Theatre, Louis Armstrong Park, and the historic Faubourg Marigny neighborhood at the ride’s end. Each of the newer red streetcars are fully accessible, while the historic green and crimson cars are not. Passengers should check the RTA website for interruptions in service due to special events and street closures. Public transportation existed in New Orleans as early as the 1830s, with railroad lines and horse-drawn or mule-drawn omnibus lines. By 1866 over five railroad companies were operating in the city, including the St. Charles Street Railroad Company. As the city grew, residents complained of soot, smoke, and noise, and a solution was needed to eliminate the steam-powered engines. Electrically powered cars replaced the old steam engines in 1893, at the same time the Carrollton Avenue Line was extended and officially renamed the St. Charles Line. Labor issues and a workers’ strike led to the consolidation of the railway companies in the early 1900s. The streetcars continued to be privately operated until 1979, when the RTA was formed. The public entity was able to receive taxpayer funding and would qualify for federal aid, something that was necessary to keep the transit system affordable and operational. The Perley Thomas streetcars on the St. Charles Line were built in 1923 by Perley A. Thomas Carworks, Inc. of North Carolina. The 20th century streetcar builder was located in North Carolina and named for its owner. The design of the New Orleans streetcars, built in the 1920s, was based on the 400-series streetcars made previously by Southern Car Works, where Thomas was an employee until the company closed. The iconic green and crimson Perley Thomas cars and the St. Charles Line they ride on have been designated as a National Historic Landmark. Proponents of saving streetcar history were unable to garner this same status for the Canal Street Line and others. However, after having been replaced by bus service in the 1940s, service returned to the Riverfront Line in 1988, and to Canal Street in the early 2000s. The famous Tennessee Williams play, A Streetcar Named Desire, was set in New Orleans along a fictional streetcar line, the Desire Line.